VATICAN CITY—Hurrying outside after hearing a disturbingly loud thud against the side of the church, Pope Francis was reportedly left to clean up the remains of a dead angel Monday that flew straight into one of the Sistine Chapel’s windows. 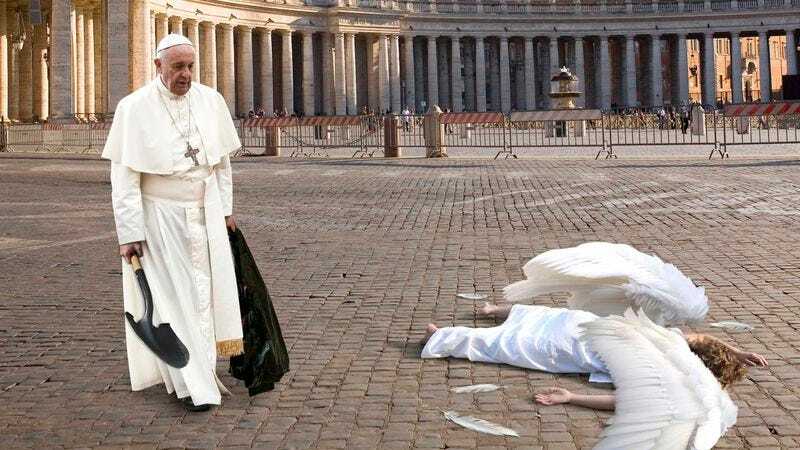 “It’s really sad; it seems like one of these guys crashes into a window at least once a week,” said the pontiff, who appeared visibly distressed while sweeping up the feathers scattered around the angel’s lifeless body. “Most of the time, their necks break and they die instantly, but once in a while they’re still twitching a bit. That’s when I find it’s best to put them out of their misery with a shovel.” At press time, the bishop of Rome was attempting to scrape off an angel splattered on the windshield of the Popemobile.